Bring the lamb chops up to room temperature. Meat should always be cooked from room temperature, as it cooks more evenly that way. Looking at the rib chops in the picture, you will notice that there is not a lot of meat on the rib bone. In truth, it is mostly fat. You may remove that fat, and I normally do for roasts. But for these little broiled chops I decided to keep it on. After all, there is at least one small bite of meat in there, albeit surrounded by fat. Season the lamb chops with salt and pepper. Lamb is a flavor that you will be unable to find in any other animal. And it will be hard for you to taste if you cover it up with a lot herbs and spices. Lamb does go well with a few herbs, listed up on the right. 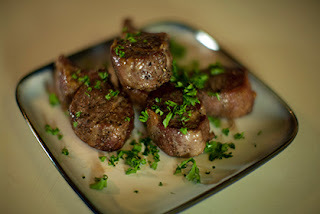 But as far as broiled lamb meat goes, it is best to simply season with just sea salt and fresh black pepper. 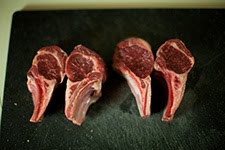 Lamb is unique in that it is a strong flavor but it is also fragile and must be seasoned delicately. 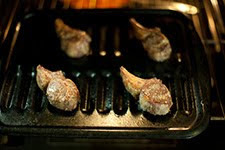 Put the lamb chops on the broiling pan under the preheated broiler. 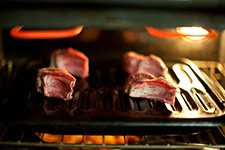 Preheat your broiler for a full 5 minutes before putting the lamb chops under it. You may be wondering why I didn't recommend rubbing the lamb chops with oil before broiling like other broiled meats. Well, lamb has a lot of its own oil and doesn't need it. But you can rub a little oil on the broiling pan just to be safe. Place the chops on the pan so they are directly under the heat. Flip the lamb chops over and broil the other side. After a few minutes the first side of the lamb chop should be getting dark and the fats should be caramelizing. Flip the chops over using a pair of spring-loaded tongs. Cook the second side of the lamb chops for a few more minutes until that side is brown and caramelized too. Use the following as a guide for checking doneness. Rare meat should be 120–125 degrees, medium 140–150 degrees, and well done 160–170 degrees. 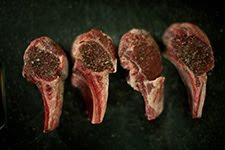 Don't forget to let the lamb chops rest for a few minutes before you eat them. If the butcher doesn't have any lamb chops available, ask if they have any rib roasts for purchase. That way you can cut your own lamb chops from the rib roast. As I have stated previously, lamb is strong but delicate flavor. Keep it simple. Try cooking it with just salt and pepper first. This will enable you to focus on the cooking technique. After you have that down, add one more complementing flavor, like cumin or rosemary. It will be a most excellent meal. If your broiler doesn't seem to be getting hot enough, it may be turning itself off because it thinks it is too hot. Try leaving the oven door open a crack. That should help. After all you aren't worried about indirect heat, just the direct heating coming off the broiler. Now..effective 11/7/2003 I was upgraded to 100% mom status or Home engineer. 17 years in MNC...Life is precious to let it slip by without any attempt to savour its contents.